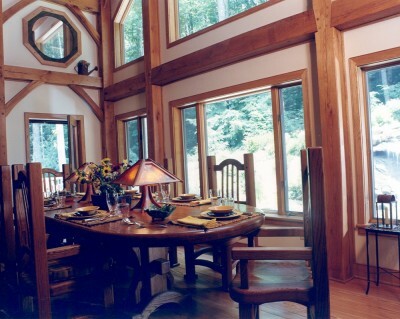 A Virginia family's vacations center around their timber frame home in rural North Carolina. Story and Photography by Esther & Franklin Schmidt. 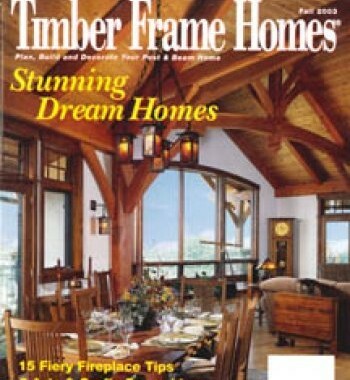 Featured in Timber Frame Homes, Fall 2003.
region of the Blue Ridge Mountains. They have a special connection to the area. "Bob and I are not beach people, so years ago, when it came time to start taking our children on vacation, we were drawn to the mountains," Carol says. "As our kids grew up and our grandchildren were born, we decided to build a house in North Carolina as a gathering place." Bob and Carol did a great deal of research even before searching for a builder. They knew they wanted a house that would emulate the simple style and feeling of a Southern mountain farmhouse. "We drew our own design knowing roughly the size, shape and room layout we wanted," Carol says. "At the same time, after looking at lots of houses in magazines, we became attracted to timber frame construction and started doing some research." In looking through a local magazine, the couple found an ad by Mountain Construction, a firm located in Boone, North Carolina. 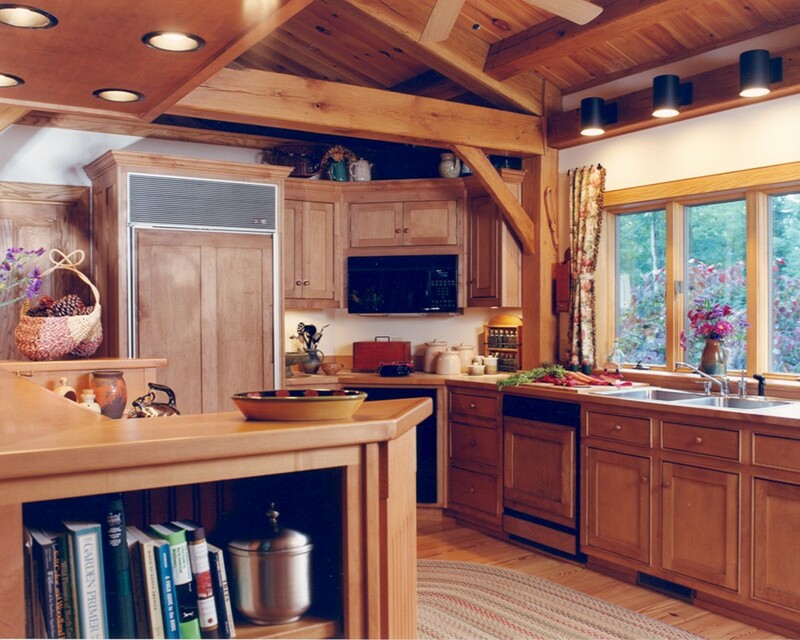 Its owner, Mark Kirkpatrick, had considerable experience in timber frame building and he responded to a query from the Tanners, immediately providing them with information about himself and his company. Once the Tanners hired Mark, as the general contractor and design consultant, he took their plans and drew them to scale. The Tanners also gave Mark a photograph they clipped from a magazine that was a great deal like what they wished for their new home's exterior. 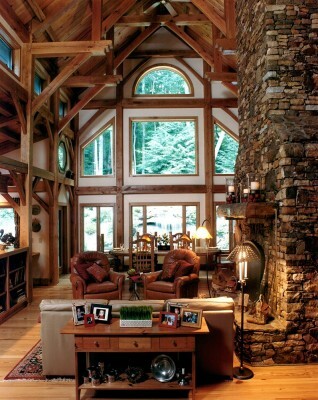 Mark then sent the plans and photograph to Hearthstone, in Dandridge, Tennessee, the company for whom he builds timber frame and log homes in North Carolina. Hearthstone's design and drafting department created blueprints from the Tanners' plans. Once the plans were approved, Hearthstone provided materials for the project, including the oak posts, beams and structural insulated panels that form the walls of the house. The collaboration worked well between Mark and the Tanners. "They were involved in every step of the building process and understood all of the issues involved in creating their home," Mark says. Construction on the couple's lot was completed in remarkably fast time--just under a year. "As quickly as it went, it felt like a long time to us because we really looked forward to being there," Carol says, "In fact, the process went smoothly, with absolutely no problems." 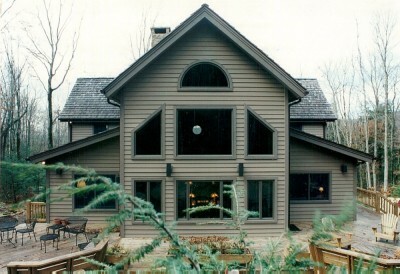 The Tanners maintained their original plans for their mountain home's aesthetic. At almost 5,000 square feet of heated living space, and a cross-shaped footprint, every inch bears the creative imprint of the many local artisans and craftsmen who took part in the building process. Everyone seemed to have poured his or her best creative energy into the house. Mark's custom designed stairway, built by Al Frye, master carpenter, at the entrance to the house, introduces a space that is at once large but comfortable, just as the Tanners envisioned it. With the exception of the downstairs bedrooms, it is an open floor plan with a massive dry stack fieldstone fireplace in the center. From the front door, it's a straight shot through the house to the floor-to-ceiling windows that overlook a rocky waterfall that the Tanners had built just beyond the flower-filled deck. It is, by any standard, an impressive view. One of the great satisfactions that both Carol and Bob have expressed is that given four bedrooms and a capacity to hold large family parties, the house is just as inviting and comfortable when only the two of them are there. This is at least in part due to Carol's careful decorating. "We had a lot of things from previous homes that we recycled and reupholstered," she explains. "Also, some of the people who worked on our house are talented cabinetmakers and we had several pieces made for the house by them." Carol also enlisted the help of Sally Tatum, who with her husband, Steve, owns Tatum Galleries that features home design products as well as fine reproduction furniture made by Steve. "Sally and I see things the same way and she was an enormous help in providing the finishing touches to the decorating," Carol says. "Carol wanted the house to achieve a 'comfortable mountain look' which we helped along by adding custom bedding and creative window treatments as well as a mix of some barnwood furniture and fine handmade pieces," Sally says. Now Carol and Bob divide their time between their Charlottesville, Virginia, home and their Hearthstone timber frame house in the North Carolina mountains. "When we're at the new house, Carol says, "and we have no guests, but it's just the two of us, we're off hiking. Here in the mountains, there are many activities in both summer and winter and we try taking advantage of a lot of them. Bob is a golfer, so he does a good bit of it when we're here. Also, I love to garden and am learning about native plants." More often than not, however, the house is full of friends, the Tanners three grown children and three grandchildren. The kitchen that opens onto the great room is large enough for several cooks to work, the dining table is long enough to seat a crowd, and the deep leather sofas are perfect for sitting in front of the fireplace. Although large in scale, the floorplan divides the house into comfort zones. These small and intimate spaces, while open to the rest of the house by Carol's careful placement of furniture, define smaller areas where people can chat or read. Comfort was always the guiding force in the planning of the house. During the design process, the Tanners opted out of air conditioning. "The temperature here in the mountains rarely gets above the low 80s, even in the warmest summer months," Carol says, "so when we open the windows and have all of the fans going, it's never hot in the house." In the winter, they keep the house warm with propane heat that they have found to be extremely efficient. They also have the added warmth of the fireplace and a wood-burning stove, which provide additional heat in the great room. The Tanners also feel that the efficiency of the Hearthstone materials they and Mark put into the house have added to its comfort. A mix of high-quality double hung, casement and glider windows, as well as structural insulated panels, all contribute to holding warmth in winter and cool air in the summer. Bob and Carol's timber frame home is a source of pride to everyone who worked on it. Mark says he is "especially proud of the great room and its massive fireplace." Carol recalls that it was Mark who spotted the antique chestnut beam in a Virginia artifacts store and suggested they use it as a mantel. 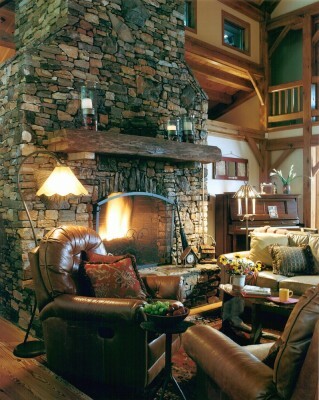 Using natural elements found in the North Carolina mountains, including oak timbers, fieldstone, and naturalized plantings, Bob and Carol achieved the home they planned with such great care. Like the antique farmhouses of the surrounding mountain communities, it is a gathering place built to host generations of Tanner friends and family. 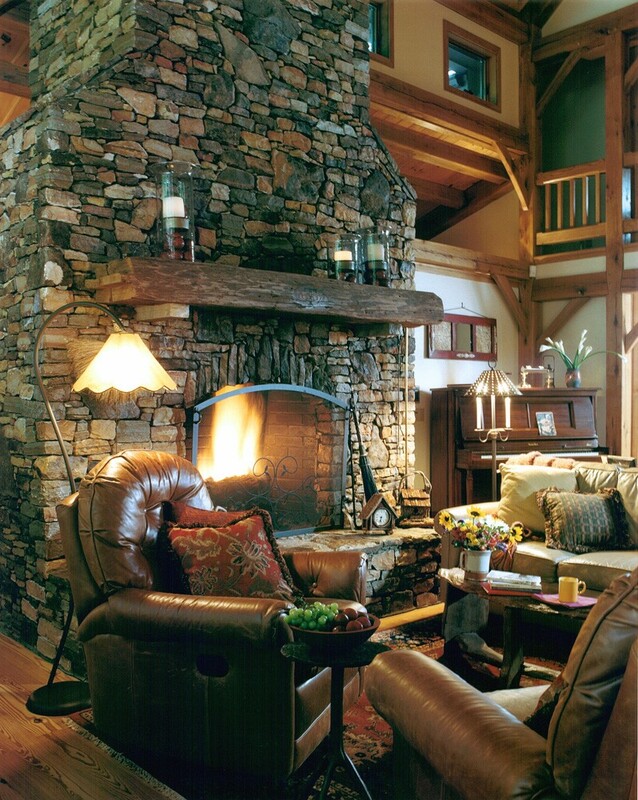 Mountain Construction is a - residential custom home builder local to Boone, Blowing Rock, Banner Elk, Linville, and Lake James, NC. 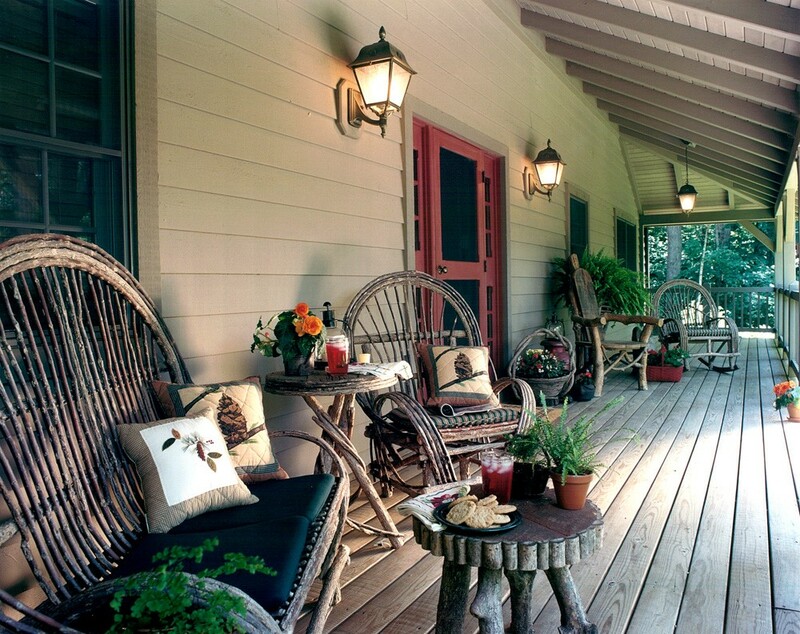 We specialize in new home construction, remodeling and historic restoration as well as porches, decks and additions. We are Certified Green Builders and have been building since 1982. We have built over 300 projects in Western North Carolina and eastern Tennessee. We are the premier North Carolina Log and Timber Frame Home Builders.